Published on June 24, 2018,	by admin in New Mexico Summer. A couple of days ago I slipped on some gravel beside my RV and fell on a landscape timber. I had some sore ribs for a while, but today I felt up to taking a hike. Coming down to the river. 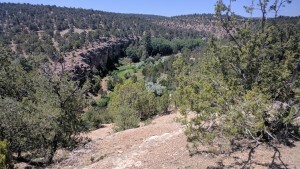 There is a short trail – no more than a mile I would guess – that loops down into a canyon beside the campground. 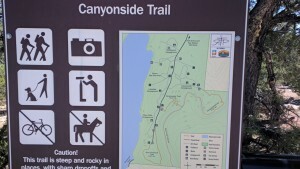 The trail is quite steep going down but switchbacks make it easier to navigate. Stepping Stones to cross stream. At the bottom the trail follows the stream for about a half mile and then climbs back up to the campground. It’s quite pretty walking along the water with the cliff walls towering over you. 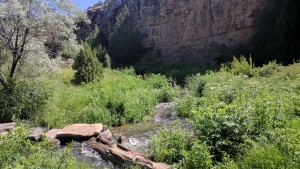 The stream is overflow from the dam that creates Bluewater Lake. I was told that a certain amount of water has to be released for the Indian reservation down below. 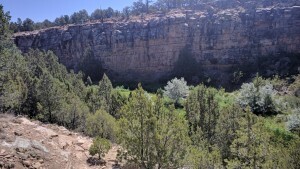 At the bottom of the canyon you can turn upstream and hike to the dam. That will be for another day. Published on June 21, 2018,	by admin in New Mexico Summer. I left Datil Wells campground on Wednesday and drove south on Interstate 25 to check out two lakes and state parks established years ago by building dams on the Rio Grande River. Both these lakes are not very pretty. The landscape surrounding the lakes remind me of what you would see if someone put a lake in Quartzsite. 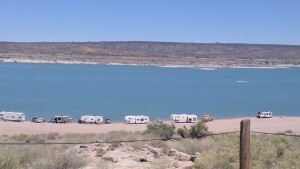 Elephant Butte is the biggest lake of any New Mexico state parks and also the most crowded. 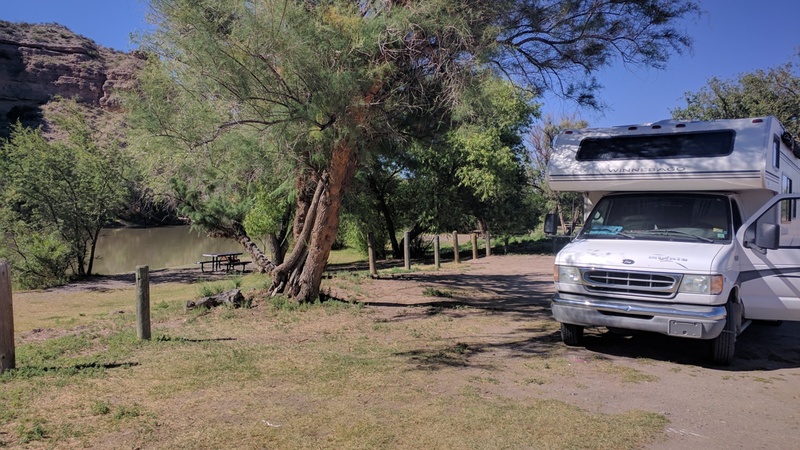 Even this time of year with temperatures hitting 100 degrees, the campground and lakefront were busy with campers and boaters. Quite a few RVs were plugged in to electric so they could run their AC but there were several that camped in non electric sites. I bought a season pass for $225 and also sprung for electric for the night. After I was settled I unloaded Honda to explore the park and surrounding towns. You can actually park down by the Lakeshore if you are brave. Some places are sandy and easy to bury a vehicle. I talked with one camper that said he had to be towed out of a bad spot. The toy of choice for water fun seems to be the jet ski. I saw many of them buzzing around on the lake. 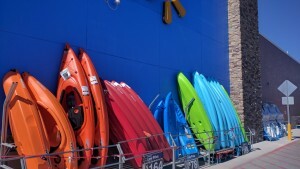 Walmart has a good selection of Kayaks. The surrounding town of Elephant Butte is the typical tourist trap – lots of restaurants, fishing shops, ect. Fifteen miles south is the city of Truth or Consequences where you can get anything you want. Caballo State Park along the river below the dam. 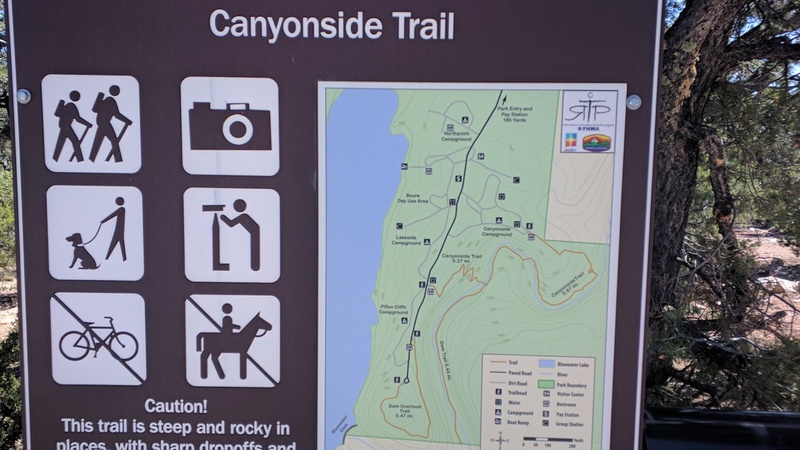 The next morning I drove a few miles south of Truth or Consequences to Caballo State Park. Caballo is way less crowded and I think prettier than Elephant Butte. Below the park are very nice sites along the river. I think I will visit and spend some time there when the weather gets a little cooler. It was a long drive north today where I found myself at Bluewater Lake State Park. Even though this park is over 7000′ it was still 90 degrees when I pulled in. I could probably spring for an electric site or run my generator some. I’ll see how much I can stand. Published on June 19, 2018,	by admin in Adventure. While I camped at Datil Wells campground in New Mexico, I rode Honda a short side trip over to the VLA. 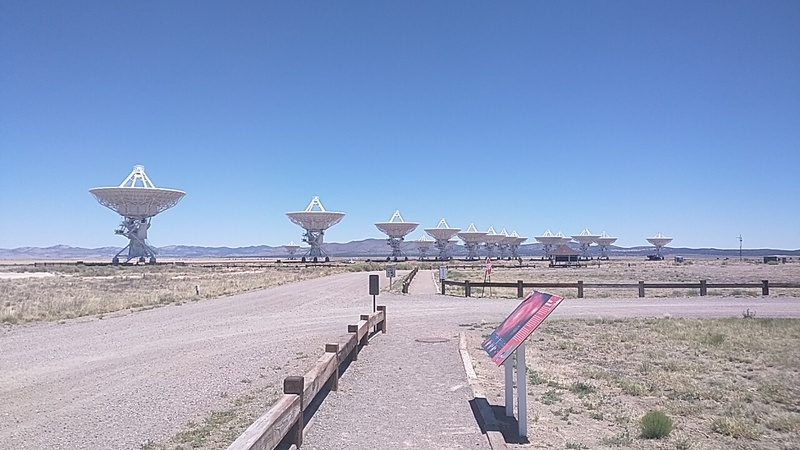 The VLA, which stands for Very Large Array, is a group of 28, giant, parabolic dishes, built in a remote section of windy, New Mexico desert, and used to capture radio waves from distant reaches of the universe. With these radio telescopes they have photographed galaxies, black holes, and thousands of cosmic objects millions of light-years away. I have been here before but it’s an interesting stop. The visitors center costs $5 for a senior, allowing you to browse the rooms of displays, watch a movie, and take a walking tour out to one of the dishes. All this science and astronomy is all quite boring, of course, but what is exciting and interesting is that Jodie Foster filmed a movie here! She even narrated the movie you watch in the visitors center. There have actually been several films that have used the VLA as a backdrop for visuals in parts of their story. It pricks the imagination to wonder what alien and unknown things might be out there and movies are good at exploiting our curiosity and making us think about it. It has been quite warm here. 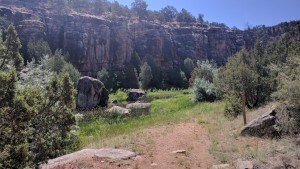 Even though this campground is at 7800′, the temperature has been in the high 80’s. I’m pretty close to Elephant Butte State Park so I may drive there to take a look. It will not be a place to camp, however, because the park is located at 4000′ elevation with temps approaching 100° this time of year. I’m definitely going to have to find someplace high up in the mountains. Published on June 15, 2018,	by admin in Adventure. I’m doing a little wandering now that all the legal hurdles of residence in Arizona have been taken care of for the next year. I found out that insuring Minnie in Arizona is way, way more expensive than South Dakota, and getting an emissions test every year is more of a hassle, but it feels good to have all my legal pieces of residence in one place. 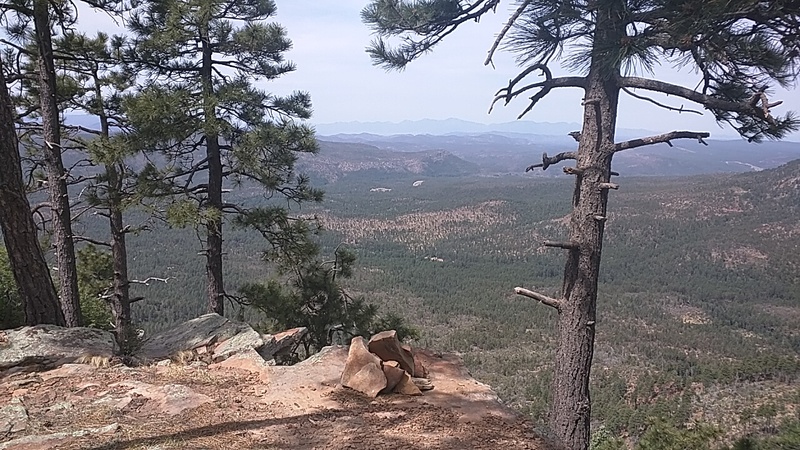 I still go by the philosophy that inquiries about my travel plans are best answered: “Wherever I end up, I guess.” Right now I’m in the Apache-Sitgraves National Forest at the Rim campground above Payson. I have been here several times before. 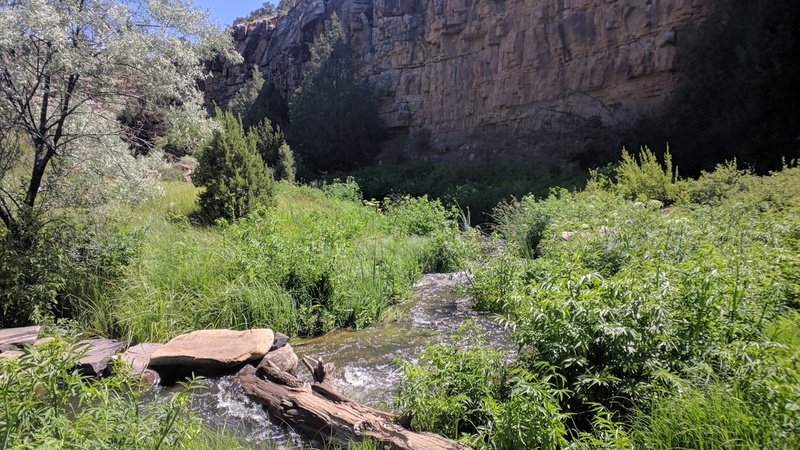 The campground is full this weekend, mainly because the fire closures have limited choices for campers, and partly because this is a Father’s Day weekend. It still bothers me that people take a trailer or tent or some other piece of camping gear, drive up to the campground several days before they intend to camp, and leave the gear in prime sites to reserve the place for the weekend. I talked to the camp host about it and came to the conclusion that even though it is illegal, no one is going to do anything about it. Last night a young couple parked in front of my camp and walked through two adjoining campsite looking for an open site. The site next to me was occupied by a vehicle left to reserve the camp for the weekend. 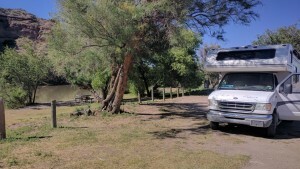 My site is large with room for more than one camper so I told them they were welcome to camp here with me. They were very happy to have a place to pitch their tent. They were courteous, respectful, and quiet during the evening. In the morning when I awoke, they were gone. There is a storm headed this way. The remnants of hurricane Bud are expected to dump some rain on eastern Arizona and western New Mexico in the next two days. I was planning on moving east into New Mexico but decided to wait here until the storm passed. That’s the nice thing about traveling with no specific time table, you can always stay put until you feel like moving. Published on May 21, 2018,	by admin in More Stuff. In an effort to record things that are happening to me and not get too personal, I’ve decided to chronicle my recent medical problems. I always hate it when people my age get together and all they can talk about is their health problems. There is nothing as important as good health, and I am as guilty as the next person for dwelling on the fact that when you reach retirement age, things in the body start to sputter. I’m not sure who it was that said, “If I would have known I would have lived this long I would have taken better care of myself.” We often criticize those that smoke or drink, but rarely think twice about constantly putting junk food into our stomachs and never making much effort to exercise. I’m not trying to get preachy here, but when we get older and don’t have to do the physical work we all did growing up, when things start to hurt and it’s hard to get out and exercise, when eating processed food is easier than making a good meal, and when there is a pill to combat the absence of diet and exercise, there is little hope that I will ever change my lifestyle. A little over a week ago, I started having lower bowel pain. At first I thought it was a bug, then I rationalized I was just constipated, and finally four days later convinced myself I had cancer. None of my self diagnosis turned out to be true, of course, but Google can truly scare you with options for every known illness under the sun. After four days of pain I finally called my doctor and they recommend I go to urgent care. I was in Payson at the time so I packed up quickly and drove down to Tempe and over to a Cigna urgent care facility. The doctor there diagnosed me with diverticulitis. I had a CT scan on my pelvis area just to be sure and left with powerful antibiotics to combat the inflammation. Several years ago I had a signoidoscopy that revealed diverticulosis ( pouches in the large intestine that are not inflamed) and was told at that time I should eat more fiber. When diverticulosis becomes diverticulitis ( inflammation in the intestine) there is sometimes no option except surgery to remove part of the intestines. When there is a flare-up of diverticulitis you need to eat a low-fiber, low-fat, soft diet to move things through more quickly and rest the colon. I was doing the exact opposite of what I should have been doing. I’m feeling fine now and will move up on the Mogollon Rim tomorrow. While I was in Tempe at brother Daryl’s, I took Minnie in to get a service engine warning light diagnosed and fixed. It turned out to be a faulty mass airflow sensor, and to diagnose and fix it was way, way more expensive than my healthcare cost. I’m in the process of changing my residence to Arizona and have only one more thing to do to complete the process. This month has been expensive with dental, healthcare, and truck repair, but I hope I can take a few weeks to rest my pocket book.